While looking through our extensive list of Rembrandt charms we have, I discovered some charms that are quite unique. Not only do we have charms for nurses and doctors, such as a hypodermic needle, we have a bed pan charm. Yes, a bed pan charm! Last Thursday was Nurse Assistants Day, so these charms would be appropriate! 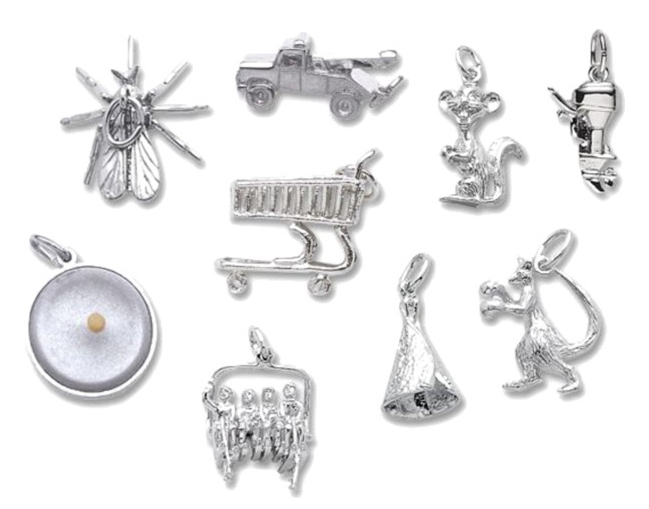 Some of the other charms I found that were quite unusual are: mosquito charm, lobster trap, water pump, wrench, outboard motor, teepee, gopher, synchronized swimming, tow truck, dump truck, vasectomy, spark plug, bull fighter, anvil, mule and a boxing kangaroo. Charms are great for creating memories and giving to loved ones for special occasions. My mother had a charm bracelet in the early 60’s and I still have it today, as a memory of her younger days. Some of the charms she added just because she liked them, and they weren’t for any particular reason. Another charm, with a mustard seed, was said to bring good luck. She also had the Eiffel tower, a car, wishbone and scissors. Do you have a charm bracelet? What kinds of charms do you have on it? What is your most unusual charm? See our charms online here. Comment below… We’d love to hear from you! This entry was posted in Jewelry, Jewelry Guides, Jewelry News, Jewelry Trends and tagged charms, charms jewelry, Jewelry, jewelry charms, rembrandt, silver charms. Bookmark the permalink.